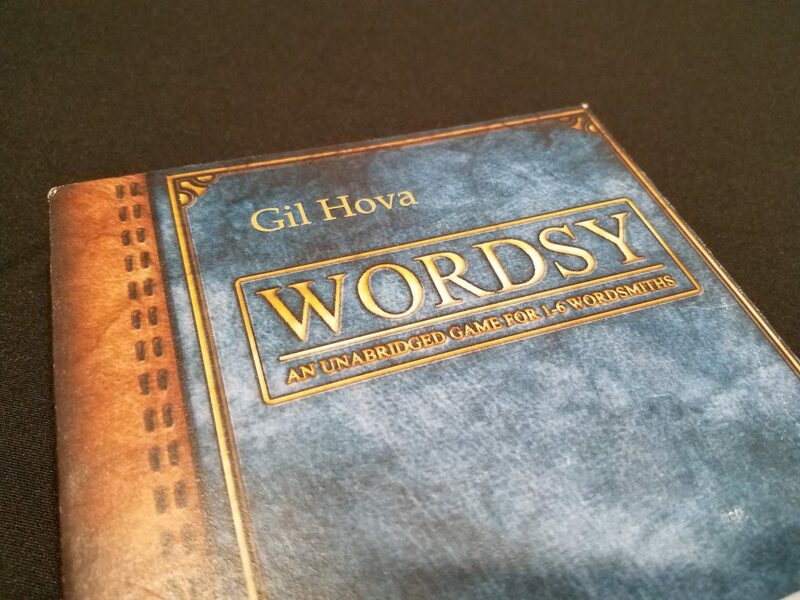 Gil Hova, the mastermind behind smash hit The Networks (as well as Bad Medicine and Battle Merchants) is at it again, this time retooling his classic Prolix by removing some of the fuss to create Wordsy, a wordsmithing game for 1-6 players now live on Kickstarter! “Unabridged” is actually pretty funny here, given how quick this game can flow. Wordsy is a real-time racing spelling game, which, honestly, is a combination of terms that is probably enough to send me into some mild fits under most circumstances (despite being Gameosity’s editor, I can only spell when I am writing and I don’t love chasing the clock). However, Wordsy manages to do all of these things in a really smart, really fresh way, easily bypassing all my anxiety and letting me get right into…why are you writing already? Jess: Because I’m done with my word. You have 30 seconds to finish yours. Andrew: CORE BLAST IT ALL!!! Ok, Wordsy works like this – a grid of 8 letter cards are placed out for everyone to see. Each column of 2 cards is worth 2, 3, 4, or 5 points. Your goal is to make a word worth the most points, using as many of the available letters as you can manage. However, unlike many other spelling games, Wordsy never restricts you to using just the letters available – if your ‘abomination’ is only missing a couple of letters, nothing at all stops you from adding whatever letters you need to complete your word – you simply don’t get points for the ones that aren’t from the grid. I looked at this and got ‘Penultimately’ for 21 points. Andrew: I really love this design choice, because it really changes the dynamic of the whole ‘spelling game’ feel, giving you more range to be creative with your vocabulary. The letters presented become anchors to build upon, rather than limitations. Jess: True, though you still haven’t mentioned the whole ‘real-time racing’ part. An added ‘U’ give us ‘Jumpy’ for a cool 19 points. Can you do better? …And then, someone goes and does it. They write their word down. And they will probably cackle maniacally as they do so, because as soon as someone does, they will also flip over the 30-second countdown, triggering a manic session of desperate writing from the rest of the players. Once everyone has written down a word (or run out of time), scores are tabulated based on letters used. There are a few standard rules about words you can’t use (proper nouns, previously used words, etc. ), and players are allowed to challenge words they don’t think are spelled correctly, disqualifying them (though penalties are assigned to the challenger should the word turn out to be correct). Jess: The whole time limit thing is great, because it does more than just force your opponents to rush their answer – if you go first and you at least tie for the best score (beating some or all of your opponents, depending on the player count), you get some bonus points for the end of the game. And if someone else ended the round but you manage to beat their score, you’ll get some points too! Andrew: These bonus points aren’t big numbers, but they do add up, and they totally incentivize pulling the trigger sooner than later. The time pressure may not be on from the beginning of the round, but that doesn’t mean there isn’t a rush to get done first! 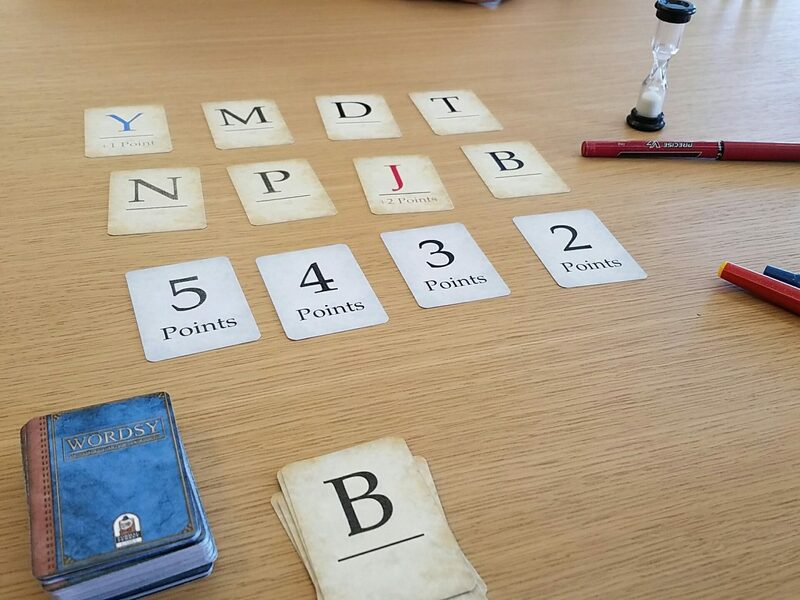 This process repeats 7 times (shuffling off some letters and replacing them with new ones each round), and then the game goes into final scoring. Your two worst word scores are dropped, the rest (plus bonus points) are added, and then you all compare final scores. Andrew: Wordsy is so smart in so many ways. The puzzle it presents is simple – open your word-hoard and release the most potent salvo you can. And yet, because of the timing element, each round has this really awesome arc of tension; you start slow and before you know it, someone decides that ‘quell’ is good enough and you’ve got 30 incredibly short seconds to decide between ‘loquacious’ and ‘qualifications’ and damn it, why did they have to start with such a short, obvious word?!? Jess: And it’s not just each round; the whole game does that, with bonus points being worth more in later rounds and low scores dropping off to compensate for a bad round or two. An early lead is great, but it guarantees nothing, and that’s a great thing! 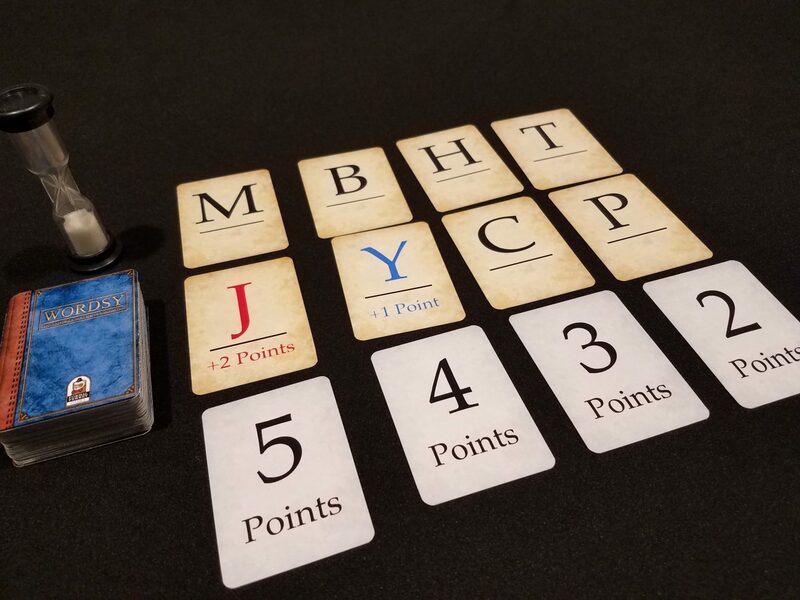 Wordsy defies genre conventions in a some really cool ways, making it the kind of spelling game that even I can love, and it works great with any number of players. What we have here is the makings of a spelling party game (though Formal Ferret isn’t particularly marketing it as such), and I see no reason why it couldn’t play 8 or even 10 at a time, despite the official player count of 6. That said, it’s also a really solid 2-player game and even boasts solitaire rules for wordsmiths looking to keep their skills sharp. We love that versatility! With tight design and a great concept, we think Wordsy will fit right into your game night rotation, even if you have non-spellers in your group. Wordsy is live on Kickstarter right now! Head on over to get yourself this excellent title! Previous Post:Get Wound up for Windup War! Next Post:Go on an Epic Kickstarter Adventure With Tiny Epic Quest!